The art of negotiating. We have a set group of toys that live in her crib so that when she wakes up in the morning she can entertain herself until it is officially time to get up. Since she sleeps with her baby doll (covered up next to her) we keep Bitty’s bottles in the crib as well. Most mornings she is feeding Bitty when I come to get her. This morning she was jumping – another favorite early morning activity – when I went to get her. When I reached in to pick her up she grabbed Bitty and then yelled, “bottles”. I stated that we didn’t need the bottles because it was time to get ready for shcool. She stopped and looked and me; then slowly raised one finger and smiled, saying “1 bottle”. She asked so nicely and it seemed like a reasonable request, so 1 bottle came out of the crib with Bitty. We went to Kennywood this past Saturday and she had so much fun! A total of 7 rides on the big Merry-Go-Round. 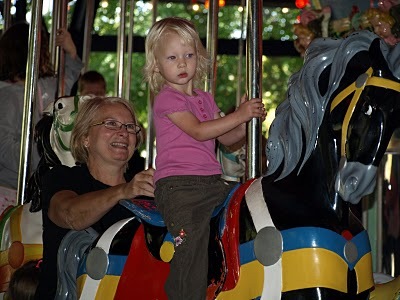 Nana, Papa, Nonni, Mommy and Daddy all took turns going on the Merry-Go-Round. Here’s one picture, more coming soon.